When a military service member leaves for deployment, it may take some time for the family to adjust to the new reality of daily routines. They may also feel more vulnerable at home. But, there are steps you can take – both before and during deployment – to ensure your family’s safety. Reinforce doors and windows. Doors and windows are some of the most common entry points for intruders, so it is vital to make sure they’re secure. Upgrade your windows’ security with reinforced panes, motion sensors and strong locks. If you have a sliding glass door, bolster its security with shatterproof film, blocking bars and a security pin. Check the locks. Verify all doors locks are in good, working order. You may also want to upgrade to home automation complete with interactive locks you can manage from your smart phone. Create unique access codes and receive a notification anytime your door lock is opened so you always know who is inside your home. Trim up the landscaping. Crooks love tall hedges or trees that make it easier for them to gain access into your home unnoticed. Address potential landscaping issues before deployment and make arrangements for someone to keep up with landscaping needs while your military spouse is on deployment since an unkempt yard is a sign a house may be an easy target. Install a home security system. A professionally monitored home security system is the best way to keep criminals at bay. If you don’t have a security system already, have one installed before deployment. Consider adding home security cameras so you always know what is happening at home while you’re away. Don’t share deployment details. Social media allows families to keep in touch with their military loved ones while on deployment, but also poses potential safety risks. Never post about your military spouse being deployed or their deployment location. This information could compromise the safety of your spouse as well as those at home. If you have children, educate them about not disclosing deployment information. Know your neighbors. Your neighbors can be a valuable resource while your spouse is deployed. Consider starting a neighborhood watch if your neighborhood doesn’t already have one. Be mindful of strangers. You should always be cautious opening your door to strangers, but during a spouse’s deployment this is even more important. Trust your gut and don’t open the door to anybody you feel uncertain about. Educate children about what to do if they hear a knock at the door and to not open the door to strangers. 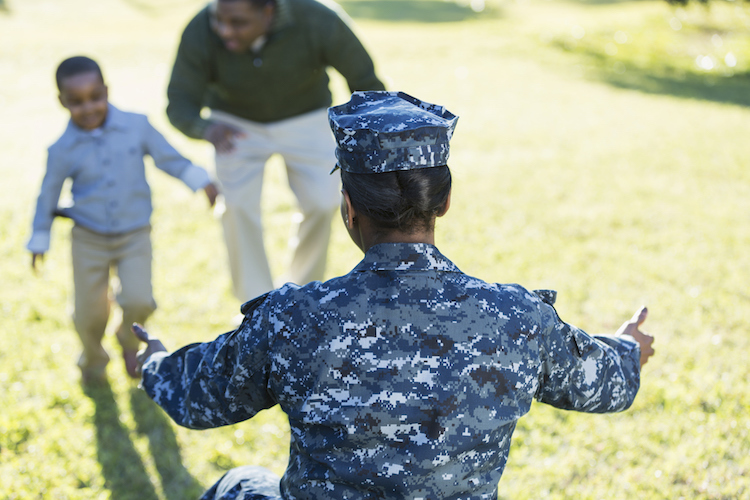 Deployment can be a stressful time for the entire family, but home safety doesn’t have to be a cause for concern. A professionally monitored home security system can protect your loved ones even when you are on the other side or the country or even overseas. For a free home security consultation, contact Crime Prevention Security Systems today. How Safe is Your Neighbordhood?